Some say the best coffee brewing temperature for water is at 205F or 95 Celsius. Knowing the temperature is one thing, but how you get that exact temperature and maintain it for the pour is another thing. 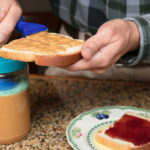 That’s not to mention the all-important pour ritual that will also effect the taste of the coffee. 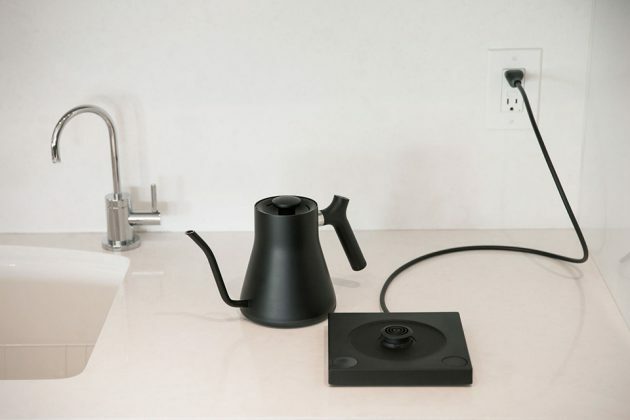 A master brewer with the right machine could pull it off, but for everyone else, there’s the Stagg EKG Electric Pour-over Kettle by Fellow. 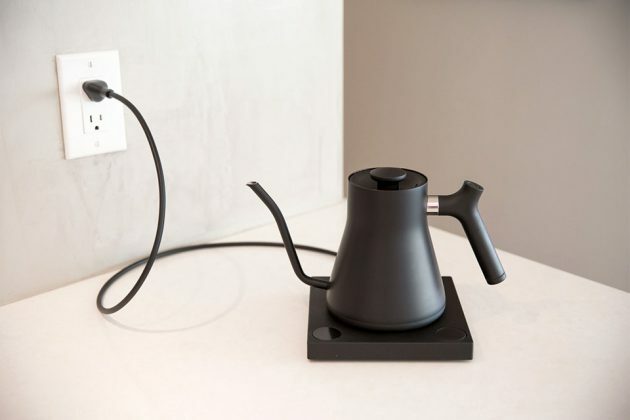 Building upon the company’s Stagg Pour-over Kettle, EKG is essentially the electric version, or if you like, a Stagg on steroid. 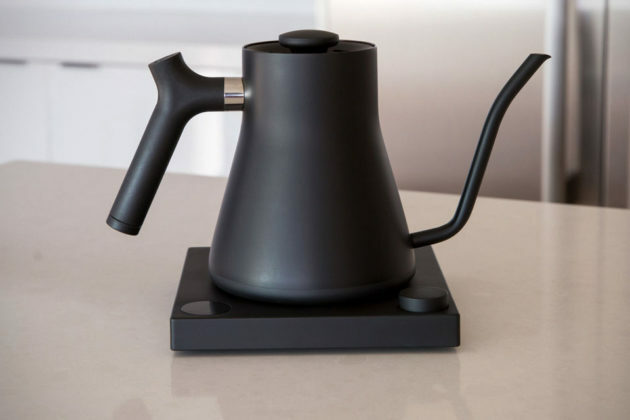 Being a Stagg, it inherits many of the original’s features, including a precious pout spout and a counterbalanced handle – all built into a minimalist design, draped in sophisticated matte black colorway. But with the EKG, it gets a matching, minimalistic base that makes the Stagg electric. The base is a design win here too. It has minimal buttons, or two, to be exact, and a LCD screen to display the current water temperature. A knob stays flushed with the base’s surface which you press to pop it up for temperature adjustment. 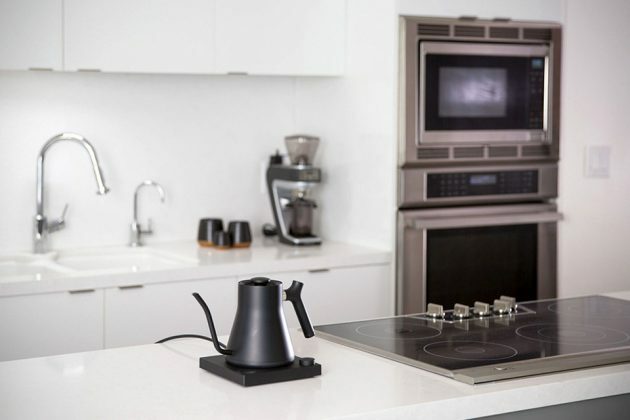 There’s a HOLD toggle switch, discreetly located at the side, to allow the kettle to maintain your desired temperature for a duration of 30 minutes. 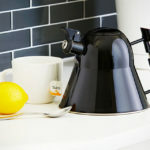 If HOLD isn’t activated, the kettle will simply go to sleep after reaching the set temperature and this means, the water will gradually loses the heat. HOLD feature is a hefty feature that makes life a lot easier, so you don’t have to reboil when you walk away a few minutes too long. And then, there’s the Stagg EKG+, a model that has all the features of the Stagg EKG, but a tad smarter – thanks to Acaia and Bluetooth connectivity. EKG+ allows remote switching on/off, set the goal temperature, and get real-time temperature updates – all from the Brewbar Tablet App. 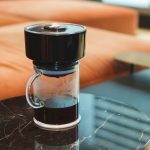 EKG+ also works with Acaia scale, connects to Baratza grinder to form your very own connected cafe. 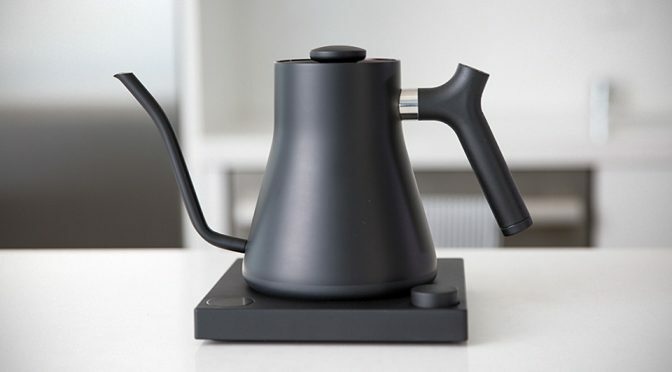 So, whether you are into brewing the perfect cuppa or a person who’s all up for a high-tech kitchen setup, Stagg EKG (or EKG+) Electric Pour-over Kettle is certainly a worthy addition. If so, you may want to consider joining over 1,000 backers on Kickstarter in pre-ordering a unit for $105-149. 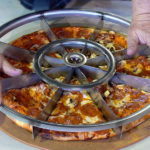 Keep going to catch an entertaining pitch video to learn more.